This chapter states that the first strategy consists of reactivating fear in order to produce its productive metamorphosis. This means accessing the awareness of the condition of vulnerability repressed both by the Prometheanism of homo creator and by the narcissistic indifference of the spectator (and consumer). Starting from the reflection of Günther Anders and Hans Jonas, the proposal is put forward to enhance the imagination as the faculty that allows us to prefigure the future: in order to think of a subject capable of feeling fear for the world and becoming liable for its future, that is, capable of becoming a responsible subject. This topic is expanded in Chap. 8. The second part of the chapter dwells on the responses that can be given to the other pathological metamorphosis of fear (see Part II, Chap. 6), namely, the excess of fear, meant as fear of the other, and its projective-persecutory torsions. 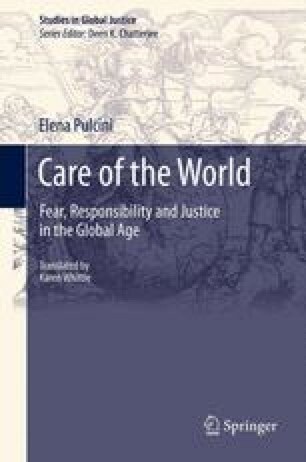 While the response to the absence of fear consists of the subject restoring his vulnerability, the response to the excess of fear implies accepting the end of (modern) immunity and becoming aware of the reality of contamination in the global age. The shift of the notion of other towards that of difference (which can neither be expelled nor assimilated), enables the idea that contamination may be given a positive connotation, in that it can prelude solidarity among different people. Vulnerability and contamination can appear as the outcomes of a virtuous metamorphosis of fear which enable the pathological torsion of unlimited individualism and endogamous communitarianism to be corrected, and respectively become the foundation of a solidaristic and a responsible subject.